IPIS has collected data on artisanal mining sites since 2009, and made it publicly accessible on webmaps and in analytical reports. The upgraded map presents new mining sites, bringing the total to more then 2400 sites visited as recently as December 2017. New information on the mining sites has been included. A new layer has been added displaying hundreds of roadblocks. 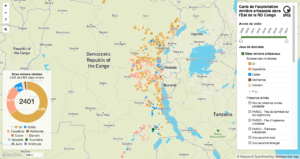 The latest update of the map has been supported by the International Organization for Migration (IOM) in the DRC, through the USAID funded Responsible Minerals Trade (RMT) project. Later this year, an updated analytical report will be published on the most recent ASM data published at this interactive map. As new data is collected during ongoing projects, IPIS will also add this new data to the map with minimal delay. The upgraded map shows mines and roadblocks. Each feature can be further examined. Click on mines to learn more about the kind of minerals mined, the presence of armed groups – possibly engaging in specific illegal activities – or state services operating on the site. A picture has been added to the majority of the mines. A small pop-up allows you to deepen your search on selling points and roadblocks. Use the filter on the right end of the map to focus your research on specific types of mines or roadblocks. Mines can be filtered on general properties such as the minerals mined, the year it has been visited, or the presence of armed groups. More specific properties can also be used to filter, like the use of mercury during gold processing, or the validation status of the mine. Roadblocks can be filtered on the operator at the roadblock, or on type of roadblocks. A small graph in the lower left of the map shows the total number of mines that are selected by the current filter, and tells you how these are distributed over the various minerals. Use it in combination with the filter to investigate how prevalent certain mining site characteristics are. A useful search function in the top left of the map allows you to search for specific mines, selling points, locations and more. A smooth zooming transition brings you straight to where you need to be! During its mining site visits, IPIS records the selling points and final destinations of the minerals sources at each site. Such data can be hard to understand when displayed in a tabular form. Lines drawn from mining sites to their respective selling points and the successive final destinations, visualise the trade flows in the region in a intelligible way. The use of different colours per actor allows to reveal the interference of armed actors at the original mining site. Interesting patterns of the influence of interference at each level of the mineral trade are uncovered. Extra layers such as mining concessions and natural park help you understand the context of the mining sites, roadblocks and other activities in DRC take place. IPIS has rebuild its entire webmap with the latest webmapping technology. This version uses Mapbox GL to render the map live in your browser. Compared to our previous webmaps with raster tiles, this results in much faster maps, with nice extra’s such as 3D viewing, gracious zooming, beautiful layering and typography, and seamless switching between road and satellite basemaps. If you like this map and want a similar one for you own project, contact us! If you want to look through the data behind the webmap in more detail, you can! Some of the layers displayed on the webmap are available on the Open Data page.